Rather than publish a light-hearted story at Christmas as we usually do, we have decided on something completely different: an investigation of the esoteric truths concealed in Handel's Messiah. We hope it will stimulate the parts mince pies and mulled wine doesn't reach. You need have no fears that we will bore you with a dry treatise on classical music, though quite why classical music should bore anyone in search of truth, beauty and goodness, we leave you to answer! And although an investigation of Messiah cannot be considered complete without discussing the music, you will be glad to hear we shall keep this brief, for this is not an article about music, but about the hidden meaning in the libretto which was the inspiration for Handel's musical score. For, as we discuss in our afterword, Handel did not write the words to his sublime oratorio, Charles Jennens did, and he chose those words with very great care, as we shall discover when we analyse what they really mean. So far as we are aware, no one has ever attempted to analyse the Biblical verses which comprise Jennens' libretto from an occult perspective, but before we do so, it is necessary to say a little about the structure of Handel's composition, the better to comprehend its inner meaning, though we do hope that will not be boring either! The libretto is divided into three parts, a number of some occult significance. The Pythagoreans called three the number of wisdom and understanding because it symbolises the trinity of Father-Mother-Son as well as the trinity of the three main principles which make up the man or woman on earth; body, lower self and Higher Self. We are told that Jesus was crucified between two thieves—a symbolic allegory for the body and lower self—those two 'imposters' as they have been called which hold the Higher Self in subjection. Jesus' mission is said to have lasted for three years and he arose from the dead on the third day. Peter denied his Master three times and Judas betrayed Him for thirty pieces of silver. The number three runs throughout the story of Jesus' life and mission as recounted in the Gospels which leads us to believe that Jennens did not divide his libretto into three parts by accident, but by design, and all this is replete with hidden meaning. Part I is concerned with prophecies about the coming of the Prince of Peace. This can be sub-divided into five sections. 1) Prophecies of Salvation; 2) the Judgement of the Nations; 3) the Annunciation; 4) the Incarnation, and; 5) Redemption and Deliverance. The basic structure of each of these sections consists of recitative and aria movements (usually for the same solo voice), followed by a large-scale chorus. Part II is a résumé of the Passion and Resurrection of Christ and the dissemination of the Gospel of Life, Light and Love which it was his mission to impart to the world. Occult Science teaches us that Christ, or more properly, the Christos, is the suffering Higher Self in every Initiate who, by taking up the cross of material life, enters the strait gate that leadeth unto Life Eternal. Consequently, Part II is an epitome of the trials and sufferings of Initiation, of which the Passion of Christ is a graphic and accurate illustration. In connection with this, H. P. Blavatsky tells us in her Collected Writings, Vol. IX, page 203 et seq: "Jesus is a deified personification of the glorified type of the great Hierophants of the Temples, and his story, as told in the New Testament, is an allegory, assuredly containing profound esoteric truths, but still an allegory. . .Every act of the Jesus of the New Testament, every word attributed to him, every event related of him during the three years of the mission he is said to have accomplished, rests on the programme of the Cycle of Initiation, a cycle founded on the precession of the equinoxes and the Signs of the Zodiac." Unless we bear this in mind, the hidden import of the sufferings and trials of the Saviour depicted in Part II will remain beyond our grasp. Although Part III is the shortest section of the libretto, it too conceals a number of occult truths concerning the subjects of Liberation, Reincarnation, Death and Resurrection. If you have not read John Temple's articles on the Nativity, the Esoteric meaning of Easter and the Sayings of the Saviour, now is the time to do so if you wish to reap the greatest benefit from this investigation. Part I of Messiah opens with the Sinfonia or Overture. This is followed by the following verses from Isaiah 40:1-3: "Comfort ye, comfort ye my people, saith your God. Speak ye comfortably to Jerusalem, and cry unto her, that her warfare is accomplished, that her iniquity is pardoned. The voice of him that crieth in the wilderness; prepare ye the way of the Lord; make straight in the desert a highway for our God." The first thing to note is that the 'Jerusalem' referred to is not a city on earth, but in a higher spiritual realm. The verse refers to the Heavenly Jerusalem in the Book of Revelation. As such, we might compare it to the World of the Astral Fire described by J Michaud in The Golden Star. The 'warfare' is the battle of Light against darkness, and the 'iniquity' of Jerusalem is thus the failure of those who do belong to that Holy city to fight the good fight, hoping that because they are 'saved', they do not need to bestir themselves on behalf of their brothers and sisters still embroiled in that war on earth. The next verse is preceded by an Air and is again taken from Isaiah (40:4). "Ev'ry valley shall be exalted, and ev'ry mountain and hill made low; the crooked straight and the rough places plain." This is pure esoteric Egyptian philosophy and therefore not easy to explain. It refers to the "mystery of the two-fold Horizon, or more exactly, the mystery of the double equinox," as Gerald Massey tells us in his masterly exposition of the Egyptian mythos—Ancient Egypt; the light of the world. It is impossible to summarise Massey's complex elucidation of this profound mystery in a few lines, so we must content ourselves with saying that at the equinoxes (March and September), the path of the Sun is made equal. At these two times of the year—astronomically and metaphysically—the powers of Light and darkness are in equilibrium; the 'valleys' (the lower realms) are raised up and the 'mountains' (the higher realms) are brought down, affording an opportunity for the 'crooked' (the evil) to be made 'straight' (gravitate to the Light) and their 'rough places' to be smoothed, or made 'plain', meaning simple, for as the Bible tells us, it is the simple in heart and mind, who behold God, or the Divine Verities. Simple indeed, when one knows the keys to the Mystery Language and is able to employ them! This enigmatic verse is followed by a Chorus whose words are taken from Isaiah 40: 5 which need no comment, for they speak for themselves. "And the glory of the Lord shall be revealed, and all flesh shall see it together: for the mouth of the Lord hath spoken it." The next section is the Accompagnato, which is followed by three verses, two from Haggai 2: 6-7, and one from Malachi 3: 1. "Thus saith the Lord, the Lord of hosts: Yet once a little while and I will shake the heavens and the earth, the sea and the dry land. And I will shake all nations; and the desire of all nations shall come. The Lord, whom ye seek, shall suddenly come to His temple, even the messenger of the Covenant, whom you delight in; behold, He shall come, saith the Lord of hosts." This refers to the successive destructions of the various continents as the great occult Ages succeed one another as we discussed in our article on Occult evolutionary cycles. It is during the Kali Yuga, or 'Black Age', the fourth of these great Ages, when the 'Nations'—meaning both peoples and generations—are truly 'shaken' up by the bitter experiences they are compelled to undergo, as we see all too clearly today. Yet, it is also at the beginning of the present Kali Yuga that the Holy Hindu Saviour, Krishna, appeared—the prototype of Christ—to renew the Covenant betwixt God and Man, which the wise 'delight in', and this is the hidden meaning of the verses from Malachi and Haggai. What follows expands on this message. "But who may abide the day of His coming, and who shall stand when He appeareth? For He is like a refiner's fire. He shall purify the sons of Levi, that they may offer unto the Lord an offering in righteousness" (Malachi 3: 2-3). In other words, the 'sinners'—the wicked Black Magicians of Atlantis and of all times, including our own—will be overcome, whilst those who hunger and thirst for the Light will be purified and redeemed. The narrative now moves to the Annunciation and the Incarnation. But before we analyse the next verses of the libretto, it is important to say something about the esoteric meaning of the name of Christ. In her Studies in Occultism, H. P. Blavatsky tells us: ". . .the mystic name of Christ is the key which unlocked the door to the ancient mysteries of the primitive Aryans, Sabeans and Egyptians." That 'key' lies in the esoteric meaning of two terms Chrestos and Christos. The former means much more than merely a 'good' man while the latter was never applied to any one living man, but to every Initiate at the moment of his second birth and resurrection. He who finds Christos within himself and recognizes the latter as his only 'way', becomes a follower and an Apostle of Christ, though he may have never been baptized, nor even have met a 'Christian', still less call himself one. The 'worthy' mentioned in the Gospel of Luke were those who had been initiated into the Mysteries and who were 'accounted worthy' to attain that "resurrection from the dead" in this life (Luke 20:35). They are those who "Neither can they die any more: for they are equal unto the angels; and are the children of God, being the children of the resurrection" (Luke 20:36). In other words, they were the great adepts of whatever religion; and these two verses apply to all those who, even without being Initiates, strive and succeed, through their own personal efforts, to attain spiritual illumination by blending their earthly personality (the lower self) with the Higher through attunement with their own Soul. And this is the esoteric meaning of the 'Son' becoming one with the 'Father'. The Chrestos blending with the Christos, or the Higher Self illuminated by the Soul. For this reason, the 'resurrection' can never be monopolized by Christians, for it is the spiritual birth-right of every human being, whatever his or her religion may be. Such an individual is a Christ-man or Christ-woman. On the other hand, those who choose to ignore the Christ principle within themselves, must die unregenerate heathens, no matter what baptisms, sacraments, lip-prayers, and dogmatic beliefs they may cling to. This then, is the true occult explanation of the meaning and significance of the name of Christ. The next verses we shall consider are taken from Isaiah 7:14 and Matthew 1:23. "Behold, a virgin shall conceive and bear a son, and shall call His name Emmanuel, God with us. John Temple has discussed this in some depth in his article on Esotericism in the Nativity, to which we refer those readers unfamiliar with the occult meaning of the birth of the Saviour. The recitations continue: "O thou that tellest good tidings to Zion, get thee up into the high mountain. O thou that tellest good tidings to Jerusalem, lift up thy voice with strength; lift it up, be not afraid; say unto the cities of Judah, behold your God! Arise, shine, for thy light is come, and the glory of the Lord is risen upon thee" (Isaiah 40: 9 and 60:1). We would remind you of what we said earlier about 'Jerusalem'. Not all the locations mentioned in the Bible are to be taken literally, many refer in a concealed manner to the higher and lower planes, and this is what the 'high mountain' and 'Zion' really mean in these verses. "For behold, darkness shall cover the earth, and gross darkness the people; but the Lord shall arise upon thee, and His glory shall be seen upon thee. And the Gentiles shall come to thy light, and kings to the brightness of thy rising" (Isaiah 60: 2-3). We live in similar times of spiritual 'darkness' today which blinds the eyes of many. It is these 'lost souls' the next verse specifically addresses. "The people that walked in darkness have seen a great light; and they that dwell in the land of the shadow of death, upon them hath the light shined" (Isaiah 9: 2). Note that two different locations are mentioned here, or two kinds of people. One who 'walk in darkness', and another who 'dwell' in 'the land of the shadow of death.' Note too that the 'land of the shadow of death' is also mentioned in the 23rd Psalm, where it is called 'the valley of the shadow of death.' Now what can this mean and what are these two places and two peoples? Have you guessed? No? Then we will tell you. Those who 'walk in darkness' dwell on earth and there are countless millions of them, whilst those who dwell in 'the land of the shadow of death' dwell in one of the lower astral worlds or planes, below this earth of ours, where conditions are considerably worse than anything we may experience here, hellish though this earth can be at times. For we must not lose sight of the fact that Occult Science teaches us that when we 'die' on earth, we proceed to that realm or plane to which we are most attuned, either a better one or a worse. And if we wish to call the former a 'heaven' and the latter a 'hell' that is quite correct too. But this does not mean that we are miraculously changed by this transition into either saints or devils. We remain what we were; either enriched in wisdom and goodness by the lessons learnt on earth or impoverished by the ignorance and evil we have embraced. And if our thoughts and deeds have condemned ourselves to dwell in a lower realm after death, then we may behold the Light even there, for the Mercy and Loving Kindness of God are infinite, and it takes but one sincere desire for redemption to escape from the darkness, and this is the hidden meaning of these seemingly obvious verses. The next section repeats the previous Chorus and concludes Part I with the well-known story of the birth of the Prince of Peace. As John Temple has discussed this in his series of articles on the Search for Truth we need not repeat his excellent explanations, though we would draw your attention to the final verses. "Then shall the eyes of the blind be opened, and the ears of the deaf unstopped. Then shall the lame man leap as an hart, and the tongue of the dumb shall sing. (Isaiah 35: 5-6 and 40:11). "He shall feed His flock like a shepherd; and He shall gather the lambs with His arm, and carry them in His bosom, and gently lead those that are with young." This is the work of the true Teacher and the true Teachings which we have endeavoured, however imperfectly, to put before you in this website. So we say with Matthew, "Come unto Him, all ye that labour, come unto Him that are heavy laden, and He will give you rest. Take his yoke upon you, and learn of Him, for He is meek and lowly of heart, and ye shall find rest unto your souls. His yoke is easy, and His burden is light" (Matthew 11: 28-30). Not only is 'his burden light', it is LIGHT, for the work of the true Teacher is to spread that Light, so the eyes of the blind may be opened, the lame shall walk the Royal Road to Freedom and the deaf hear the words of Truth. Part II begins with a verse from John 1:29: "Behold the Lamb of God, that taketh away the sin of the world." And so He does, for the work of the true Teacher and the true Teachings is to dispel ignorance, which is the only 'sin' Occult Science acknowledges. What now follows is a heartbreaking recital of the tests and trials of initiation which every teacher of the Eternal Verities has to suffer in order to bring their message of Light and Love to this disbelieving world. "He was despised and rejected of men, a man of sorrows and acquainted with grief. He gave His back to the smiters, and His cheeks to them that plucked off His hair: He hid not His face from shame and spitting. He was despised. . .Surely He hath borne our griefs, and carried our sorrows!" (Isaiah 53: 3-6). Need we elaborate on this? John Temple summarised the trials and tests of Initiation in his article on the Esoteric meaning of Easter. We quote: "All the details of the supposed historical crucifixion of Jesus are symbols, carefully designed to paint a vivid allegorical picture of the tests and trials of Initiation and the life and work of the True Teacher. It is the Higher Self of the Initiate—the Christ-principle in us all—who is the ever crucified and suffering Messiah; crucified on the cross of wooden ignorance and intolerance of the unevolved masses. His meat is still gall, his drink vinegar, and the wreath of thorns crowns his everlasting and evercoming brow; wet with the sweat of unappreciated Service. He is still bound hand and foot, his garments, spiritual and material, are parted for evermore amongst His despoilers, who may cast lots or merely grab them if they can. His words and deeds are made a mock of by His everlasting enemies, the mean in heart, the low in spirituality, the jealous and spiteful, apt sons of their jealous and spiteful god of Hell." This explains the rather odd reference by Isaiah to the Messiah giving 'His back to the smiters, and His cheeks to them that plucked off His hair.' Hair may be regarded as the crowning glory of a man or woman. And even today, to lose one's hair is considered a misfortune greatly to be dreaded, particularly by the ladies! So in this we see a concealed reference to Christ's crowning glory; his spiritual gifts, which the 'smiters' covet and attempt to pluck from Him as John Temple explains. And it is not true also, as the libretto now tells us that, "All they that see Him laugh Him to scorn; they shoot out their lips, and shake their heads, saying: "He trusted in God that He would deliver Him; let Him deliver Him, if He delight in Him. Thy rebuke hath broken His heart: He is full of heaviness. He looked for some to have pity on Him, but there was no man, neither found He any to comfort him" (Psalm 22: 7-8 and 69:20). This is a perfect portrait of the Messenger of Light, be he or she the humblest of the servants of God, or the greatest. "Behold, and see if there be any sorrow like unto His sorrow" (Lamentations 1: 12). Yes, behold how the venomous scorpions among men attack the man or woman of Light who fills them with rage and spite! Behold Pythagoras, first persecuted, then betrayed, to be burnt alive with the flower of his disciples! Or Hypatia, the wise and beautiful Greek philosopher, torn to pieces by an enraged mob of Christian fanatics! Even in modern times, we find Madame Blavatsky vilified and persecuted from the day she began her mission, to be betrayed by her closest followers when she needed them most, and die at the young age of 60, broken in health and spirit. The next verse tells us that the sorrows of the true Teacher are magnified by being estranged from his or her Heavenly kin. "He was cut off out of the land of the living: for the transgressions of Thy people was He stricken" (Isaiah 53: 8). The 'land of the living' is, of course, the high realm depicted so beautifully and truly in Vision Six of The Golden Star, which every true Teacher belongs to and must leave to fulfil their mission in this veil of tears and base ingratitude. Such are the earthly 'rewards' of those who labour on behalf of the Light. No wonder so very few are eager to enter the strait gate that leads to Life Eternal! But, as the following verses tell us, there is no nobler calling that any man can take up than that of the true Priest Illuminate—the Messenger of Light and Love—which the life of Christ illustrates for us in this sublime oratorio. "How beautiful are the feet of them that preach the gospel of peace, and bring glad tidings of good things" (Isaiah 52: 7; Romans 10: 15). Their sound is gone out into all lands, and their words unto the ends of the world" (Romans 10: 18; Psalm 19: 4). Let us take comfort from these glad tidings and not be downcast by the next two verses. "Why do the nations so furiously rage together, and why do the people imagine a vain thing? The kings of the earth rise up, and the rulers take counsel together against the Lord, and against His anointed" (Psalm 2: 1-2). For "He that dwelleth in Heav'n shall laugh them to scorn; The Lord shall have them in derision. Thou shalt break them with a rod of iron; thou shalt dash them in pieces like a potter's vessel" (Psalm 2: 4 and 9). All this is true, for the work of the true Teacher is never in vain, whatever appearances to the contrary may suggest. And this is the true meaning of the Passion of Christ and of every other Messenger from God to man, who gives up their life that others may seek the Light which leadeth to liberation and freedom from all earthly shackles. So, together, let us sing the Chorus that concludes Part II: "Hallelujah: for the Lord God Omnipotent reigneth" (Revelation 19: 6). "The kingdom of this world is become the kingdom of our Lord, and of His Christ; and He shall reign for ever and ever" (Revelation 11: 15) "Hallelujah!" The final part of Messiah begins with one of the finest verses in the entire Bible, and to hear it sung by a truly gifted Soprano is a balm to the heart and joy to the mind. "I know that my Redeemer liveth, and that He shall stand at the latter day upon the earth. And though worms destroy this body, yet in my flesh shall I see God." (Job 19: 25-26). What Divine Music there is in these sublime words: 'I know that my Redeemer liveth'. That 'redeemer' is our very own Soul, who so longs to gather us into His loving arms. He is the Christos, the Master within, the Saviour who dwells in the heart of every one of us. The 'still, small voice' of the Silence so few listen to and fewer still follow. And truly 'He shall stand at the latter day upon the earth'. Not this earth; this realm of tears, broken hearts and vain illusions, but the higher Earth, the New Jerusalem, the Heaven depicted in The Revelation of Peter (also referred to as The Apocryphal Gospel of St. Peter), in which we may read: "And as we prayed, suddenly there appeared two men standing before the Lord upon whom we were not able to look. For there issued from their countenance a ray as of the sun, and their raiment was shining so as the eye of man never saw the like: for no mouth is able to declare nor heart to conceive the glory wherewith they were clad and the beauty of their countenance. And the Lord showed me a very great region outside this world exceeding bright with light, and the air of that place illuminated with the beams of the sun, and the earth of itself flowering with blossoms that fade not, and full of spices and plants, fair-flowering and incorruptible, and bearing blessed fruit. And so great was the blossom that the odour thereof was borne thence even unto us. And the dwellers in that place were clad with the raiment of shining angels, and their raiment was like unto their land in beauty and splendour." From this it is clear that by 'flesh' Paul did not mean our physical body, but the spiritual bodies Peter and his fellow Apostles beheld in vision, which the righteous inhabit in the higher realms. The next verses are very important too. Please pay careful attention. "Behold, I tell you a mystery; we shall not all sleep, but we shall all be changed in a moment, in the twinkling of an eye, at the last trumpet. The trumpet shall sound, and the dead shall be raised incorruptible, and we shall be changed. For this corruptible must put on incorruption and this mortal must put on immortality" (1 Corinthians 15: 51-52). Paul, as an initiate of the Greek Mysteries, was well aware of the laws that govern resurrection and reincarnation, but carefully concealed his knowledge in the time-honoured manner of all initiates. Sleep, as we explain in our article on Life after Death and part four of Astral Conversations, has been called the 'little death' and for good reason, for the two states have much in common. Some of us will 'sleep' after death. That is to say we will either dream away the time between incarnations or remain in state of unconsciousness akin to dreamless sleep. But those who have made conscious contact with their own Soul, and whose Higher Selves are awake, be it only partially, will experience more or less full consciousness after the death of their physical body. Such will truly be changed 'in the twinkling of an eye' as Paul tells us. Death will be a liberation to them and they will immediately find themselves in a new and much more perfect body than they possessed on earth. That body, which some call 'astral', is just as solid as the body we know here, only it is not subject to decay, and this is what Paul means by 'incorruption' putting on 'immortality'. The business about trumpets is probably a later interpolation by some meddling Churchman for Paul knew better than to believe in the silly notion of the 'last trumpet' when the dead shall miraculously arise from their coffins like Zombies in a third-rate Hollywood movie! The Messiah ends with three verses from the Book of Revelation: "Worthy is the Lamb that was slain, and hath redeemed us to God by His blood, to receive power, and riches, and wisdom, and strength, and honour, and glory, and blessing. Blessing and honour, glory and power, be unto Him that sitteth upon the throne, and unto the Lamb, for ever and ever. Amen" (Revelation 5: 12-14). If we remember that the 'lamb' is a direct copy of the Egyptian zootype depicted as Horus in one phase of the Mythos and Osiris in the other, which was symbolised in the Ram-headed God Amen-Ra at Thebes, the meaning of these verses as an allegory for the life and work of the true Teacher and Messenger is clear. He is always 'slain' by his enemies, whether literally murdered or figuratively defeated. His 'blood' is the Holy Teachings he disseminates which, when truly understood and practised, do indeed redeem us to God by freeing us from the evils of ignorance. For this is the work of the true Teacher at all times and to all peoples. There we must call a halt to this investigation in the hope that it has revealed a few of the truths which are concealed in this sublime oratorio, as well as encouraging those of you who have never heard it to attend a performance. Wherever you live in the world, Handel's Messiah is a regular feature in concert halls at Christmas, so there is no reason you should not be able hear it. Once you have, you will never forget it, or the important messages it has for those of us on the path to the Light. © Copyright occult-mysteries.org. All rights reserved. Published 7 December 2018. In this afterword we look at the origins of the libretto and the music of Messiah. As we said in the introduction to our investigation, the libretto for Messiah was not written by Handel, but by Charles Jennens (1700-1773). Jennens was a wealthy landowner and patron of the arts with somewhat controversial religious views which prevented him from receiving a doctorate in Theology from Balliol College, Oxford, which he left in 1716 without graduating. Jennens' deep knowledge of the Bible and abiding love for Handel's music led him to help finance the publication of every Handel score from 1725 until the composer's death in 1759. He also contributed several libretti, all of which were published anonymously, which speaks volumes for his humility and erudition! By 1741, after their collaboration on Saul, a warm friendship developed between Jennens and Handel who became a frequent visitor to the Jennens family estate at Gopsall, in Leicestershire. Jennens first makes mention of Messiah in a letter to his friend, Edward Holdsworth, written on 10 July 1741. We know Handel began work on the score on 22 August, so we may be sure that Jennens' libretto was of very recent origin. Although we have no evidence that Handel collaborated in the selection or preparation of the libretto, such as he did in the case of Saul; the fact that he made no significant changes to it suggests that he thoroughly approved of Jennens' work. However, the reverse was not the case, for we find Jennens writing to Holdsworth: "I have with great difficulty made him (Handel) correct some of the grossest faults in the composition; but he retained his overture obstinately, in which there are some passages far unworthy of Handel, but much more unworthy of the Messiah." Over the years musicologists have not been slow to castigate Jennens for daring to criticise Handel's score, but the fact that this Divinely inspired composer largely accepted Jennens' amendments suggests to us that Handel at least partially recognised the esoteric meaning concealed in the libretto which Jennens' critics are wholly unaware of. From this it follows that Jennens must have possessed considerable occult knowledge. Indeed, we are certain of it, for no one without such knowledge, whether conscious or unconscious, could possibly have chosen the highly significant verses from the Bible which we analysed in our article. Having said this, there is no evidence that Jennens was ever directly involved with Occultism, though, like many of his contemporaries, he was a Freemason. Consequently, his reticence was in no way unusual in the 18th century, as we saw in our investigation of the hidden meanings in Mozart's Magic Flute. In those times the Church was still a powerful force in the secular world, and although it no longer burned heretics at the stake, its anathemas against those who questioned its dogmas, or worse, were seen to be associated with the 'occult', were not to be lightly dismissed. Many a man who fell foul of its opprobrium had his career and reputation irrevocably ruined, and this is reason enough for Jennens to have exercised the profoundest discretion and circumspection in regard to his private beliefs and studies. So much for Jennens' important contribution to Messiah, what of the work itself? The music was completed in just 24 days. Having received Jennens' libretto after 10 July 1741, Handel began work on 22 August and completed the score on 14 September. The original manuscript is held in the British Library's music collection and is scored for 2 trumpets, timpani, 2 oboes, 2 violins, viola, and basso continuo (cello, double bass, and harpsichord). Although Messiah is not in any particular key, Handel's tonal scheme has been summarised as "an aspiration towards D major", a key long associated with Light and Life, and thus with the theme of spiritual resurrection which is the soul of the music and the libretto. As the oratorio proceeds, D major emerges at significant points, primarily the "trumpet" movements with their uplifting messages. It is the key in which the work reaches its triumphant ending. In the absence of a predominant key, one musicologist has suggested that Handel used the device of the "ascending fourth" as a unifying motif, most noticeably in the first two notes of "I know that my Redeemer liveth" and on numerous other occasions. E minor is used for the opening symphony, and as this is the note associated with the Higher Self, it is eminently appropriate. Part II begins in G minor, which as we saw in our article on the Magic of Music, has the colour blue and corresponds to the aura in man. We all know what it means to feel 'blue' and blues music evokes sadness, longing and loss, all emotions which we associate with the Passion of the Saviour which forms the dominant theme in this part of Messiah. D Major reoccurs in Part Three, with the words "Behold, I tell you a mystery", which is followed by the long aria "The trumpet shall sound", marked pomposo ma non allegro (dignified but not fast). Handel originally wrote this in da capo form, but shortened it to dal segno, probably before the first performance. D major also ushers in the choral finale: "Worthy is the Lamb", leading to the apocalyptic "Amen" which concludes the oratorio. The musicians among our readers may explore these correspondences further if they wish, but we have said enough, for, as we point out in several articles, we are not musicians! But we cannot omit to mention that Handel appended his manuscript with the abbreviation "SDG (Soli Deo Gloria), meaning "To God alone the glory". This postcriptum, together with the rapidity of the work leaves no doubt in our minds that Messiah was the fruit of Divine Inspiration, though some carping critics think otherwise! Handel confirms this when he tells us that he "saw all heaven before him" whilst writing the famous 'Hallelujah' chorus which concludes Part II. 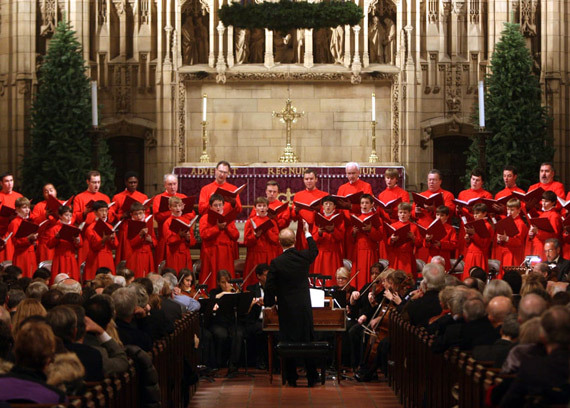 The tradition which connects Messiah with Christmas owes nothing to the oratorio's origins which arose from Jennens' libretto. In his letter to Edward Holdsworth, mentioned earlier, Jennens tells us: "Handel says he will do nothing next Winter, but I hope I shall persuade him to set another Scripture Collection I have made for him, and perform it for his own Benefit in Passion Week. I hope he will lay out his whole Genius and Skill upon it, that the Composition may excel all his former Compositions, as the Subject excels every other Subject. The Subject is Messiah." Handel is said to have wept during the composition of his score. We have no doubt of it, for there is no greater blessing nor more humbling an experience than to be the recipient of Divine Inspiration. Jennens arrived in London at the end of November 1741 hoping to find Handel there and hear the first performance of Messiah, but to his surprise learnt that the composer had taken his score to Ireland with him! Not much is known about the reason for Handel's precipitate departure, but he was probably invited to perform in Ireland by the Duke of Devonshire. Dublin had an active theatre and concert life and Handel's visit coincided with the opening of a new concert venue, the Great Music Hall in Fishamble Street, where Handel gave two performances of his pastoral ode based on the poetry of John Milton—L'Allegro, his pastoral operetta Acis and Galatea and his oratorio Esther between December 1741 and February 1742. This series of concerts finished on 7 April 1742, but Handel was impatient to capitalise on his eager audience, so arranged the first performance of Messiah for April 13. The premiere was a huge triumph. The alto soloist, Susanna Cibber, was an actress who had attracted scandal in the past, but legend has it that her emotional performance of 'He was despised' moved Dr Patrick Delany—the husband of one of Handel's most ardent champions—to exclaim "Woman, for this, be all your sins forgiven." This was a generous sentiment, if a somewhat disingenuous one, as the good doctor was no stranger to 'sin' himself having kept at least one mistress during his marriages! The enthusiastic reception accorded to Messiah in Dublin was not repeated in London when Handel introduced the work at the Covent Garden theatre on 23 March 1743. The performance was overshadowed by press criticism that the subject matter of the work was too exalted to be performed in public, particularly by secular singer-actresses such as Susanna Cibber who was tainted with 'sin'! In an attempt to deflect such pious sensibilities, Handel avoided the name Messiah and presented the work as the "New Sacred Oratorio." The custom of standing for the "Hallelujah" chorus originates from a belief that, at the London premiere, King George II did so, which would have obliged all to stand. Like many pretty stories, this one is unlikely to be true, as there is no evidence that the king was present or that he attended any subsequent performances of Messiah! The first reference to the practice of standing appears in a letter dated over seven years later when the chapel of the Foundling Hospital became the venue for regular charity performances of Messiah from 1750 onwards. London's initially cool reception of Messiah led Handel to reduce the season's planned six performances to three, and not to present the work at all in 1744—to the considerable annoyance of Jennens, whose relations with the composer were temporarily soured. At Jennens' request, Handel made several changes in the music for the 1745 season. "Their sound is gone out" became a choral piece, the soprano song "Rejoice greatly" was shortened and the transpositions for Cibber's voice were restored to their original soprano range. In 1749 the work was revived at Covent Garden, under the proper title of Messiah, which saw the appearance of two female soloists who were henceforth closely associated with Handel's music: Giulia Frasi and Caterina Galli. In the following year these were joined by the male alto Gaetano Guadagni, for whom Handel composed new versions of "But who may abide" and "Thou art gone up on high." The year 1750 saw the institution of the annual charity performances of Messiah at London's Foundling Hospital. The 1754 performance at the hospital is the first for which full details of the orchestral and vocal forces survive. The orchestra included fifteen violins, five violas, three cellos, two double-basses, four bassoons, four oboes, two trumpets, two horns and drums. In the chorus of nineteen were six trebles from the Chapel Royal; the remainder, all men, were altos, tenors and basses. Frasi, Galli and Beard led the five soloists, who were required to assist the chorus. For this performance the transposed Guadagni arias were restored to the soprano voice. By 1754 Handel was losing his sight, and in 1755 he turned over the direction of Messiah hospital performance to his pupil, J. C. Smith. On 6 April 1759, when he was blind and in failing health, Handel insisted on attending a performance of Messiah at the Theatre Royal in Covent Garden. Just eight days later, this God-like genius, his mission accomplished, returned to his Heavenly Home. 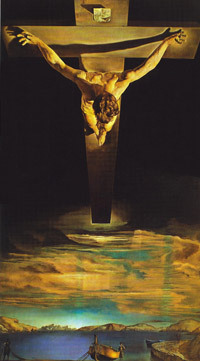 NOTE: The image heading the sidebar is Christ of Saint John of the Cross by Salvador Dali, 1951, oil on canvas, held at the Kelvingrove Art Gallery and Museum, Glasgow. Occult symbolism in The Magic Flute—an illustration and explanation of the science of occult symbolism. The Magic of Music—an investigation of the occult nature of music and its power for good and evil. The Broken Violin—a musical allegory of the search for harmony and truth. Hidden Wisdom in the Bible—an occult investigation of the hidden meaning concealed in the Bible. Symbolism, allegory and mythology in J. R. R. Tolkien's The Lord of the Rings. The Magic of Poetry—an investigation of the concealed wisdom in sublime poetry.